Slice of Pie Cookbooks & Entertaining: Tomatoes & Pineapple! I have had too many tomatoes! Can you possibly have too many tomatoes? No! I enjoy tomato jam ... It is good on toast with eggs and bacon ... It is good poured over a round of melting brie cheese ... It is good over a block of cream cheese. It is just good. What I enjoy even more is tomato jam that has been enhanced with the flavors of other things. 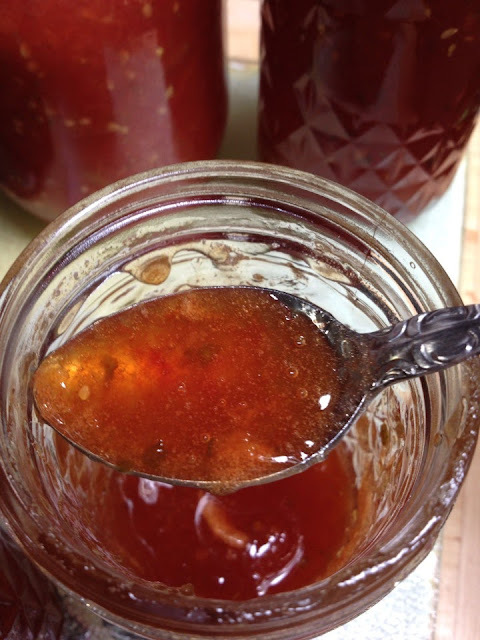 I have a really healthy pineapple sage plant this year and I've enjoyed snipping it and using it in many things, so I decided it could only make my tomato jam better ... and adding a can of crushed pineapple to the batch made it even better. Let me tell you how this creation started! 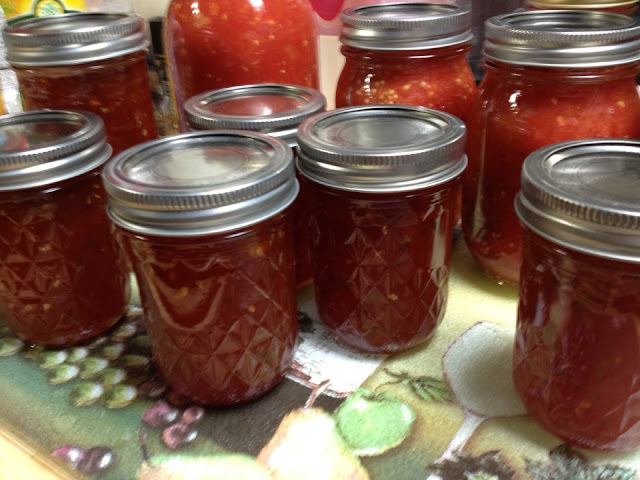 I had 3 cups of tomato juice left from canning tomatoes. I hot pack my tomatoes, so having a little juice left isn't unusual, but this time I had enough to make a batch of jam. Here's the recipe. Simmer 3 cups of tomato juice, 1 can of crushed pineapple with its juice, 3 cups of cherry or grape tomatoes (with their peels), 4 Tablespoons chopped pineapple sage leaves and 7 cups of sugar. There is a little natural pectin in these fruits, but it is essentially the sugar syrup that actually thickens. Simmer the ingredients for 10 minutes, then drop in 2 pouches of liquid pectin. Bring the mixture to a full rolling boil and let it boil for 2 minutes. Turn off the heat; skim any foam from the top of the jam; pour in sterilized jars and cover with sterilized lids; process in a water bath canner for 10 minutes. Before you move on, visit my home page and check out some of my other posts! I'm going to share my post with a few parties this week, so make sure you skip on over and check out the other party posts! Summer Salads from Good Food: Local!